This really awesome video of a Singapura paddle boarding with her human in the UK popped up on Facebook yesterday. Noodle and her human, Nigel, go paddle boarding regularly on rivers in Essex and Sussex. They even have an Instagram page. But as cool as this story is, it gets cooler. 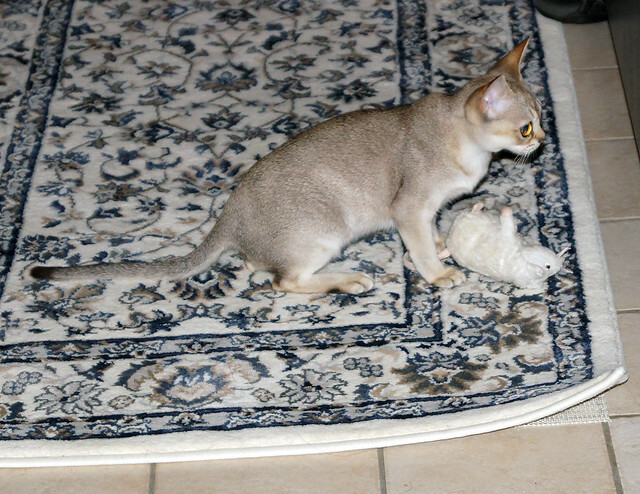 Noodle (Singaneko Artemis) comes from a British cattery, and her father is Bakardi Minimali*PL (“Keiko”). Kinsey, the breeder, has also written two children’s books about Keiko and his littermate brother Paolo (Bolt Minimali*PL). I discovered – and bought – these books last year after we got Logan, delighted to find any books starring Singas. Of course, you know that our Izaak also comes from Minimali*PL. But if you look at Paolo’s, Keiko’s and Zak’s pedigrees, you’ll find that all three boys’ parents are Tinytoy Rus Mafoj*PL (father) and Angelina Minimali*PL (mother)…so Zak is Paolo and Keiko’s full brother, and Noodle is his neice! Paolo and Keiko are three years older than Zak…but how amazing is it to discover that Zak’s brothers are children’s book stars!? And his neice is a famous paddle boarder!? I guess Zak has a lot to live up to. It’s not often you find a news story about a Singapura, but back in 2013 a Singa kitten in London named Bruce Lee managed to dial 999 and summon the police. Next they’ll be wanting their own iPhones. One of my favourite time-wasters, Bored Panda, posted a hilarious video of a Japanese Singapura named Malt dragging his favourite toy around the house. This just shows how “small but mighty” Singas are. You can see more photos of Malt on his Instagram page. Last week, Catster Magazine published “11 Reasons to Sing the Singapura’s Praises” and it’s really a nice little list. Check it out!